Prepare your console, gentlemen, as we Crow_bar decided to please the new port of classic shooter Quake 2. This time it is drawn in HARDWARE mode, so now we can enjoy first-class graphics. 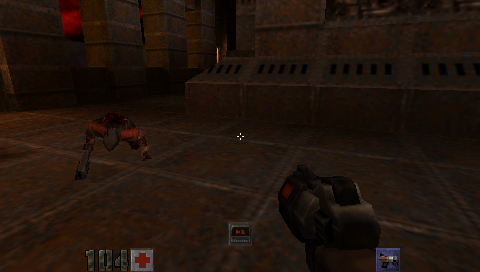 1) Copy "Quake II [hardware]" to the folder PSP / GAME /. 3) Run from the menu PSP "Game -> Memory Stick". No more issues ranged and failures, except, perhaps, the rare moments when you killed the enemy's body hangs in the air, not wanting to fall. A similar statue can be left for others to enjoy, but you can turn for the pieces of "control" All management changes smoothly from the settings menu, so if you want a game you can always adjust by itself. Oh, yes! I almost forgot that you can now play online with bots. Need to activate them in the folder PSP / GAME / PSPQuakeII QUAKE2.INI finish in the file "+ game crbot", then run the game and create a network Battle, after loading the bots see the setup menu. Quake II [hardware] (05/02/10) NEWEST!